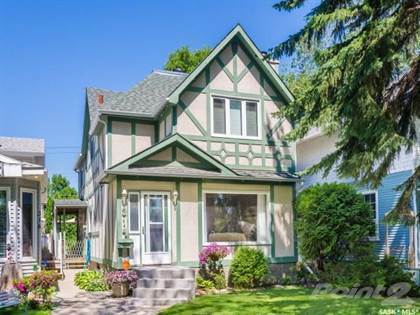 A truly lovely character home that has been extremely well maintained and upgraded. As you enter the home, you will be greeted by a large living room with high ceilings, gas fireplace with a gorgeous marble surround and hardwood floors. The space is bright and open but maintains a cozy feel of a character home. The ceilings were replaced and spotlights were added in 2016. Adjoining you will find a comfortable upgraded galley kitchen, granite countertops (2016), and a spacious dining area. The back of the house is a remarkable bonus addition, that provides a large space for a bright office/workspace, closet, large main floor laundry area and a modern 2 piece bath (2011). Pristine hardwood and newer quality laminate adorn the main level. Garden doors lead to a simply charming back yard space that is nearly maintenance free. A treated wrap-deck, and brick patio surrounded by trees and perennials, this is the perfect place for entertaining friends and family. The yard is fully fenced, private and includes a storage shed and an adorable single garage (2008). The side of the house provides a second entry, and a covered BBQ deck. Upstairs you will find 3 well-appointed and large bedrooms, a 4-piece bath (2010) and, as a bonus, another family room surrounded with windows and a wood burning fireplace. All rooms have large closets and big windows. The basement is clean and dry with 6' ceilings and provides a usable space for storage or a play area for the kids. Built high off the street and with a large mature yard, this home has awesome street appeal. Upgrades are plenty and also include: Roof/shingles (2012), furnace (1997), electrical (1989) and windows were replaced between 2007-2010. In a fantastic Caswelll Hill location, this home is situated on a wide/ double lane street and is close to Sask Polytechnic, a beautiful new Mayfair pool, several parks and schools, Idylwyld drive, access to Circle Drive, the airport and downtown. You will not want to miss this one!! Hi, I'd like to find out more information about 314 32nd STREET W. Thanks so much!